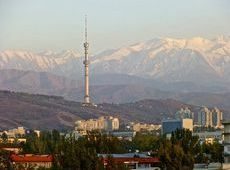 Almaty, Kazakhstan's largest city, is beautifully located in the foothills of the Alatau Mountains. 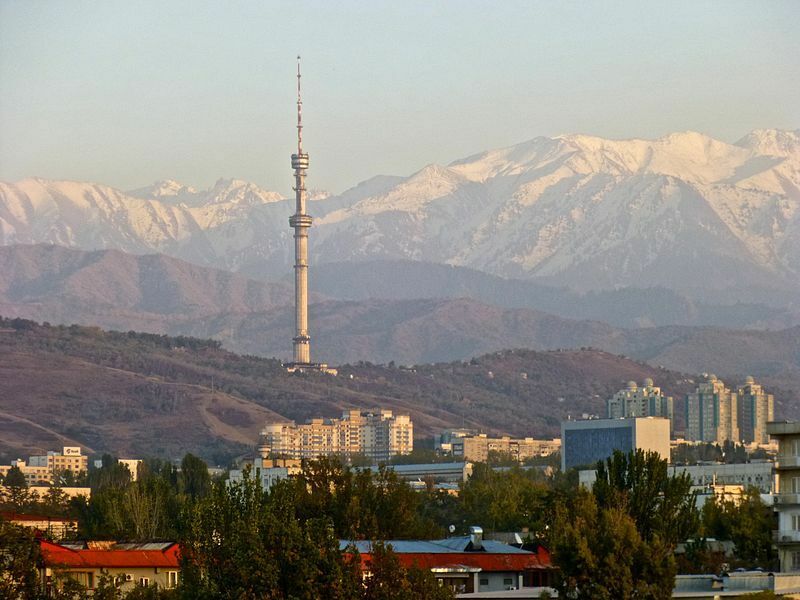 Almaty was the country's capital until 1997 and remains Kazakhstan's major trading and cultural hub. Accommodation We stay in Almaty for the first night of the program in comfortable 4-star central city hotel offering en-suite twin, double or single rooms. Typical local breakfasts, lunches and dinners are provided. We enjoy a short walking tour of the Old City with visits to Panfilov Park and the tsarist-era Nikolsky Sobor (Cathedral of St Nicholas). 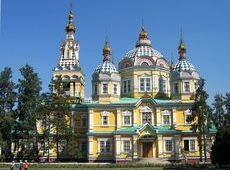 The pale turquoise of the Cathedral with its gold onion domes, was built in 1909 and later used as a stable for Bolshevik cavalry, before reopening as a church in 1980. Panfilov Park, a green oasis in Almaty's central area, was renamed by the Soviets in honour of 28 Kazakh soldiers led by General Panfilov who died on the outskirts of Moscow during WWII. A monument in the park honours these soldiers and an Eternal Flame memorialises all the people who died during the war. Also located in the park is Zenkov Cathedral, a wooden Orthodox church built at the turn of the century without the use of nails. Time permitting we will visit the Museum of Musical Instruments, located in a 1907 Russian style wooden building formerly called the House of Officers. Created in 1980, the museum exhibits a collection of traditional Kazakh instruments, including the dombra, a two-stringed instrument ubiquitous in Central Asia. 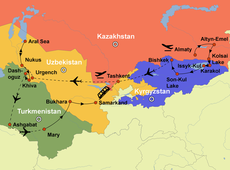 We transfer to Altyn-Emel National Park via Kapchagay and Chengeldy village. The park is on the north bank of the Ili River and was designated in 1996. The name 'Altyn Emel' has a Mongolian origin meaning 'a gold saddle'. Accommodation We stay in comfortable but basic guest houses with shared bathrooms, offering twin, double or single rooms. Typical local breakfast, lunch and dinner is provided. We will visit the Altyn-Emel National Park in the eastern region of Kazakhstan. The park is a unique desert- mountain complex located on a branch of the ancient Silk Road. After lunch we visit the stone columns 'Oshaktas' that are situated near by Kalkan Mountains. We also visit the Singing Barchans, crescent-shaped sand dunes that 'sing' with the wind. En-route to the beautiful Kol-Sai Lakes, we pause at the Charyn Canyon, often referred to as the 'little brother' of the Grand Canyon. Charyn Canyon is an 80km long canyon carved out by the Sharyn River and is located close to the Chinese border. It is part of the Sharyn National Park, which was established 23 February 2004. The canyon varies in depth from between 150 to 300 metres. We continue onto our accommodation at Kol-Sai Lakes. Our second day at Kol-Sai Lakes provides us with the opportunity to enjoy two of the three lakes during a ¾ day easy walking excursion. The lowest lake, at 1,818m, stretches for 1km. 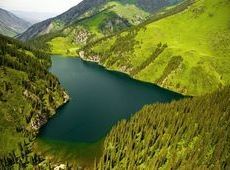 The middle lake (2,252m) is the largest and the most beautiful and is 5km from the first lake. The two lower lakes are surrounded by fir trees, alpine meadows and mountain pastures. The dark blue colour of the water and the silence and calmness of the area are the unique features of Kol-Sai Lakes. We stay at Kol-Sai Lakes for 2 nights in comfortable but basic guest houses with shared bathrooms, offering twin, double or single rooms. Typical local breakfasts, lunches and dinners are provided. Views from our guest houses look down on the magnificent lake. We immerse ourselves in the best of Kazakh scenery from high mountain ranges to deep canyons and dark blue deep lakes, dotted by quaint villages and small towns. We cross into Kyrgyzstan at the 'Kegen' border crossing and continue to the beautiful town of Karakol located near the eastern tip of Issyk-Kul Lake. We stay in Karakol for two nights in comfortable 3-star central city hotel offering en-suite twin, double or single rooms. Typical local breakfasts, lunches and dinners are provided. 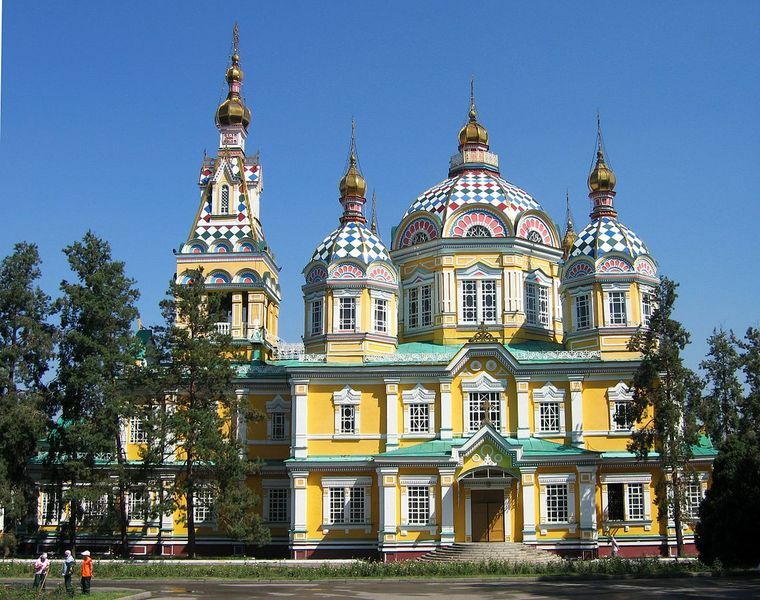 During our stay in Karakol, a city tour is included where we visit a Chinese built mosque that looks like a Buddhist temple, constructed in 1907 for the Dungan (Muslim people of Chinese origin) and incredibly, it was built without a single nail. We also visit the local Cathedral for Orthodox worshippers, a church showing the past presence of Russians in the community. Nearby, we also visit to the Djety-Oguz Gorge in the Valley of Seven Bulls, which are unusually bright red sandstone rock formations. We travel along the eastern and northern shores of beautiful Issyk-Kul Lake, the largest lake in the Tien-Shan Mountains. The lake has an extraordinary maximum depth of about 700 metres and is set at an altitude of 1,608 metres above sea level. Issyk-Kul Lake is unique in that dozens of rivers and streams flow into the lake, but none flow out. Issyk-Kul ('hot lake' in Kyrgyz) is the world's second largest salt lake (after the Caspian) and is 180km long by 70km wide. The lake never freezes (hence the name), even though surrounded by mountains that ring the lake. 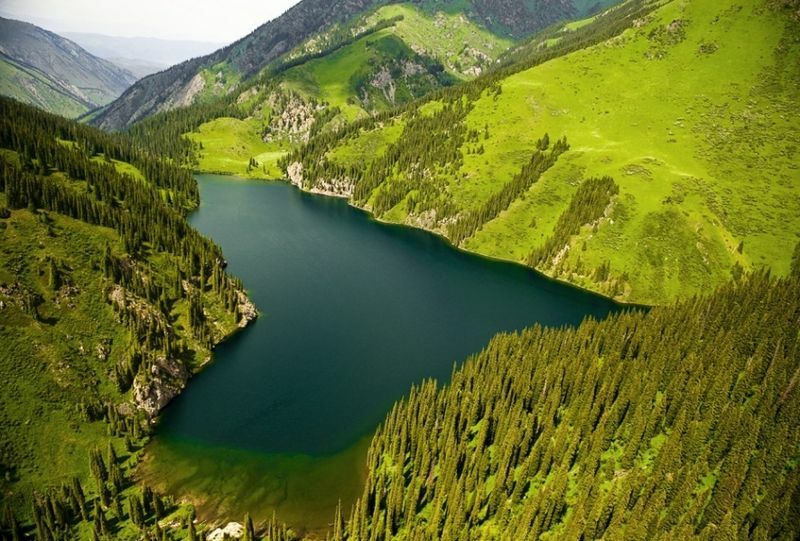 To the north are the Kungei ('Sunny') Ala-Too Mountains and are criss-crossed by trekking routes including ones that connect the lake with Almaty - while to the south lie the Teskei ('Shady') Ala- Too Mountain Range. These mountain ranges protect Issyk-Kul Lake from winds that bring either extreme cold - or extremely hot winds to the surrounding region. Moreover, the lake valley is a unique combination of sea, steppe, mountain climates and eternal ice zone. The very appearance of Issyk-Kul Lake is a 'geological mystery'. Issyk-Kul is a special place famous for its warm, sandy beaches, thermal mineral radon springs, alpine meadows and coniferous forests. All this is beside the enchanting and alluring peaks and glaciers, including many of the highest mountain verticals. Issyk-Kul Lake has been held in high regard by the Kyrgyz and it is known as the “pearl of the Tien-Shan”. In 2004, the government declared the lake as the “property of the nation”. On the northern shore of the lake, near the town of Cholpon-Ata, we stay for one night in a comfortable 4-star hotel offering en-suite twin, double or single rooms. Typical local breakfast, lunch and dinner is provided. We continue our journey to the beautiful valley of Son-Kul Lake and enjoy lunch in Kochkor village, a hub for the surrounding Kochkor Valley. We stay for two nights in traditional yurts on the shore of Son-Kul Lake. Yurts are more sophisticated than tents and have heating. Due to the rustic nature of this unique accommodation, the yurts have 'outhouse' style toilets with access to water and a private area for washing. The yurts offer twin, double or single rooms. Traditional local nomad breakfasts, lunches and dinners are provided. We experience some of the most stunning scenery in this remote region of Central Asia. We will learn about lifestyle of the local shepherds and visit their yurts. There will be time for short hikes in the nearby hills as well as an opportunity for a horse ride. The local Kyrgyz are affable people working in agriculture and traditional Kyrgyz crafts. We will visit a felt carpet making enterprise and also a 'living' museum of local needlewomen. At Son-Kul Lake, the scenery we encounter is breath-taking with wide, brilliant, steel coloured expanse of water that appears majestic, quiet and transparent. The lake is 3,000 metres above sea level and is 29km long and 18 km wide. It is located on the ancient Silk Road from Kashgar and Bishkek. We have traditional nomad dinners and for the next two nights, we are accommodated in yurts on the shore of the lake. En-route to the capital and largest city of Kyrgyzstan, we visit the Burana Tower, one of the only remaining watchtowers on the Silk Road. This structure is situated in what was the centre of the ancient town of Balasagun. The tower is 25 metres high, although the original height was 45 metres. We will have an opportunity to visit the fascinating museum nearby, housing artefacts that cover an area of 36 hectares. Lunch will be with a Kyrgyz family living near the Burana Tower. This will be a wonderful opportunity to meet the host and sample traditional Kyrgyz dishes. We continue our journey to Bishkek, a relatively young city with a chequered history. Bishkek started as a garrison town called Frunze and was only given its Kyrgyz name of Bishkek in 1991. We stay in Bishkek for 2 nights in a comfortable 4-star central city hotel offering en-suite twin, double or single rooms. Typical local breakfasts, lunches and dinners are provided. We enjoy a guided city tour of Bishkek including a visit to the White House, a white marble palace housing the Kyrgyz Government and the president's office. We will also visit a traditional Asian Bazaar. During our guided city tour we will explore neighbourhoods of leafy parks, beautiful gardens including Panfilov Park and a scattering of Soviet era statues and monuments. We visit the National Historical Museum, featuring the history and culture of the Kyrgyz people. Also showcased at this museum are Soviet-era achievements during the Communist period. We also visit the White House, the seat of the Kyrgyzstan government, including the president's office and the republic's parliament. We will also explore a traditional bazaar in this modern western style city. From Bishkek, we have a short afternoon flight to Tashkent, Uzbekistan. Although it does not look it today, Tashkent is one of the oldest cities in Uzbekistan. There is evidence in the Chaktal Mountains about 80 kilometres from Tashkent of rock painting dating back 4,000 years. In the 2nd century BC, the town was known as Ming Uryuk. A major caravan crossroads, it was taken by the Arabs in 751AD and by Genghis Khan in the 13 century. Amir Temur (Tamerlane) feasted here in the 14th century and the Shaibanid khans in the 15th and 16th centuries. 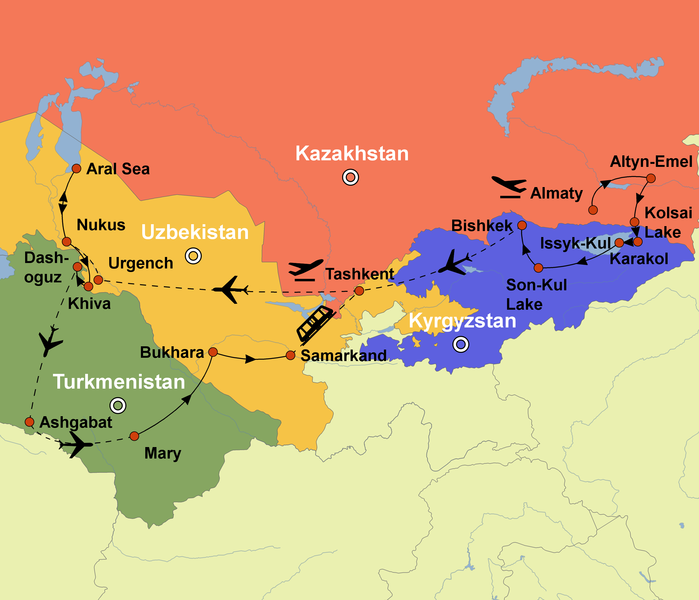 The Russian Empire arrived in 1865 and Uzbekistan was not an autonomous country again until 1991. Tashkent lost much of its architectural history in a huge earthquake in 1966 and although it is an old city, most of it has been built since then. Today, the city is a jumble of wide treelined boulevards, oversized 20th century Soviet buildings and reconstructed traces of the old city with mud- walled houses, narrow winding lanes and mosques. We overnight in Tashkent in a comfortable 4-star central city hotel offering en-suite twin, double or single rooms. Typical local breakfasts, lunches and dinners are provided. An in depth city tour of Tashkent, including a visit to Amir Temur Square with its imposing statue of Amir Temur on horseback. We will also visit the Museum of History, the largest and most comprehensive museum in the country. From Tashkent, we have a short afternoon flight to Urgench, Uzbekistan. On arrival, we transfer by coach to Nukus. We overnight in Nukus for a night before and after our expedition to the Aral Sea. Our accommodation is a comfortable 3-star central city hotel offering en-suite twin, double or single rooms. Typical local breakfasts, lunches and dinners are provided. After breakfast we drive to the Aral Sea in 4x4 vehicles with 3 passengers in each vehicle. En-route we visit Kungrad city, the gate town of ancient Khorezm. It was inhabited by Sako-Massaget tribes and today the city is within the independent republic of Karakalpakstan. We also pause at the Plato Ustyurt, a region with many Neolithic period sites. At around 6pm, we arrive at the shores of the Aral Sea. This is the second largest lake in Asia and receives water from the two largest rivers in central Asia, Amudarya and Syrdarya. The Aral Sea is much smaller in area than 10 - 15 years ago due to the ecological disaster caused during the Soviet era. We overnight in basic but comfortable tents with shared bathroom facilities. All essential equipment is supplied including sleeping bags and blankets. We depart our camp after breakfast for our return journey to Nukus. At lunchtime we arrive at Muynak city and enjoy lunch at a local restaurant. Muynak was not that long ago one of the biggest ports in Uzbekistan and it supplied Central Asia with fish products, due to its location on the shore of the Aral Sea. Since the Aral Sea has retreated, the remnants of fishermen's ships remain where they were left and this is a stark reminder of this great eco-catastrophe. We arrive into Nukus in the early evening in time for dinner at our hotel. Nukus to Khiva, Uzbekistan We drive to Khiva, one of the oldest cities in Central Asia with the second largest population in the Khorezm Region, after Urgench. Khiva is one of the best-preserved cities along the ancient Silk Road. Legend says that the oasis of Khiva was founded at the place where Shem, son of Noah, discovered water in the desert, and that the city got its name from Shem's joyful shout, “Hey va!” at the discovery. We stay in Khiva for two nights in a comfortable 3.5-star central city hotel offering en-suite twin, double or single rooms. Typical local breakfasts, lunches and dinners are provided. 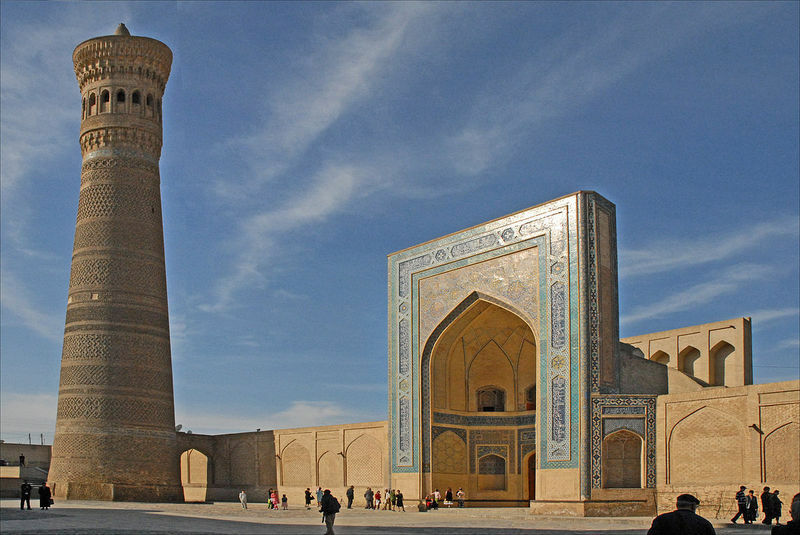 Included is a full day's field trip of Khiva with visits to the Kelte Minar and Muhammad Amin Khan Madrassah, the Tash Hovli Palace and the ingeniously designed Mausoleum of Seyid Alaudin. We also visit the Savitsky Museum of Art named after Igor Savitsky. It displays a fine collection of Soviet avant- garde of the 1920s - 1930s. Included are exhibits ranging from ancient Khorezmian of Toprak Kala, to national Karakalpak Cubism. Zoroastrian influences are evident on the facades of Khiva's buildings. Even mosques and madrassas carry the symbols of different religions, revealing how the cities of the Silk Road were crossroads of philosophies, faiths and cultures. Today this living city is part museum town, part re-creation of life hundreds of years ago. Archaeologists have found traces of human habitation around Khiva dating from the 5th century BC. It was for hundreds of years a stop on the old Silk Road and a fortress town, but it was not until the 16th century that Khiva became the capital of the Khorezm Khanate. The khanate ruled the surrounding area for over 300 years, and was a well-known slave-trading centre. We have an evening guided walk in Khiva's inner city. We continue with our exploration of Khiva with an expert-led walk to the monuments of the Old Town, or Itchan Kala, including the Tash-Hauli Palace, or Stone House built in the 19th century for the reigning khan and his four wives. We also explore the impressive Karakalpak State Museum showcasing the history, fauna and flora of the region including the last giant Turan (Caspian) tiger caught in 1972. We take a short drive to the Uzbek-Turkmen border crossing at 'Shavat' where we cross into Turkmenistan and continue to Dashoguz and experience local Turkmen hospitality. We overnight in Dashogoz in a comfortable 4-star central city hotel offering en-suite twin, double or single rooms. Typical local breakfasts, lunches and dinners are provided. After breakfast, we transfer to Dashoguz Airport for a short flight to Ashgabat, the capital of Turkmenistan. On arrival, we commence our exploration over two days of one of the most beautiful cities in Asia. Ashgabat is known for the many elaborate marble monuments constructed by former President-for-Life Saparmurat Niyazov, also known as Turkmenbashi (which means 'Leader of all Turkmen'). The tradition has continued and in 2013 Ashgabat was listed in the Guinness Book of World Records as the 'Most White Marble City in the World'. Turkmenbashi was also responsible for building the 80-metre Arch of Neutrality, on which a 13-metre golden statue of him revolved to continuously face the sun. The statue is now stationary, though still imposing and we will admire this during our time in this city. We overnight in Ashgabat in a comfortable 4-star central city hotel offering en-suite twin, double or single rooms. Typical local breakfasts, lunches and dinners are provided. An overview of the history and position of Ashgabat. We will explore the city and view the amazing monument to the founder of the Turkmen nation in Oguz Khan which is surrounded by the world's largest complex of computer controlled water fountains. We will also wander through the famous 'Altyn Asyr' oriental bazaar located near Ashgabat. 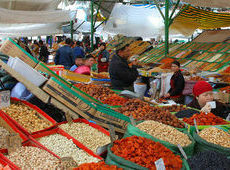 This is a large covered market selling all kinds of foodstuffs, including prepared foods, fruits, nuts, vodka, high quality caviar and traditional breads. Before independence, this was where most ethnic Russians shopped. We also visit the reputable Museum of Turkmen Carpets which has on display the largest handmade carpet in the world. Also included in our exploration is the Monument to Lenin which was erected in 1927 and was one of the few monuments which survived the great earthquake that devastated this city in 1948. After dinner, we commence our night tour of the city stopping at the Palace of Happiness where we admire the view of the city lights at night. On our second day in Ashgabat, we venture about 15km west of the city to the site of the capital of the ancient Parthian Kingdom of Nissa. From the 3rd century BC to the early 3rd century AD, the Parthian Empire dominated this region of central Asia. Though Nissa was ruled by a succession of dynasties, it remained an important centre in the ancient world until the 13th century, when the Mongols sacked it. Today archaeological work continues at Nissa, and was declared a UNESCO World Heritage Site in 2007. We meet with local archaeologists while visiting the excavations that continue to reveal more about this ancient city. On our return to Ashgabat, we pause at Kipchuk village to admire Turkmenbashi's personal mosque. 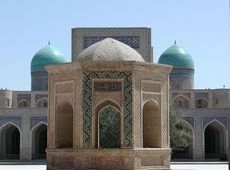 The huge US$100 million mosque in the former Turkmen President Niyazov's hometown of Kipchuk was inaugurated in 2004. The mosque is large enough to hold 10,000 people. Its 50-metre golden dome had to be lowered in place by helicopter. Verses from Niyazov's own spiritual book, the Ruhnama, are etched on the walls alongside Koranic verses. We also visit the National Museum of History and Ethnography with its superb collection of carved ivory drinking horns from Nissa. We have an afternoon field trip to the UNESCO World Heritage site of Koneurgench, the capital of the Khorezmshahs. We visit many monuments including the Portal or Caravansaray, Academy of Horezm and the Kotlug Timur Minaret (one of the tallest minarets in Central Asia). In the late afternoon, we transfer to Ashgabat airport for a short flight to Mary. On arrival, we transfer to our hotel. We stay in Mary for two nights in comfortable 4-star central city hotel offering en-suite twin, double or single rooms. Typical local breakfasts, lunches and dinners are provided. We enjoy a full day's touring with a field trip to the UNESCO World Heritage Site of Old Merv, which was known in the past as 'Marv-i—shah-Jahan' (King of the World). For about 300 years it was one of the great cities of the Islamic world alongside Damascus, Cairo and Baghdad. It is claimed that Old Merv was briefly the largest city in the world in the 12th century and for eight years was the capital of World Islamic Khalifat. 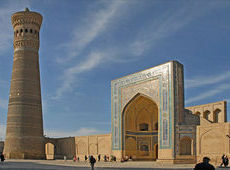 The city served as a base for Muslim expansion into Central Asia and is located on the historical Silk Road. Among the various sites visited are: Gyz Gala and Oglan Gala; the Beni Makhan Mosque - first mosque built in Central Asia; Sultan Sanjar Mausoleum; and Ibn Zeid Mausoleum. We return to Mary for a late afternoon walking tour of central part of the town. We transfer by coach across the Garagum Desert to Turkmenabat and stop for lunch at a local restaurant. We continue another 50km to the Farab / Alat border crossing located near the great Amu Darya River. Here we enter into Uzbekistan once again and travel a further 130km to Bukhara, Uzbekistan. We stay in Bukhara for two nights in comfortable 4-star central city hotel offering en-suite twin, double or single rooms. Typical local breakfasts, lunches and dinners are provided. Our exploration of this ancient city includes a visit to the impressive Ark Fortress. The current structure has been built and rebuilt on the same site throughout its history, and has preserved the form, purpose and function of the first ark. Like the mediaeval castle complexes of Europe, Bukhara's Ark Fortress served the Emirs of Bukhara as a residence, audience hall and as protection from neighbouring enemies. We enjoy an orientation walk around the centre of the UNESCO World Heritage Site of the Old Town that includes Lyabi-Haus Plaza where throughout history it has been used as a place to meet and relax in the shade. The atmosphere is cooled by the long rectangular reflecting pool that makes up the centre of the plaza and the shade of the trees that ring the plaza. The mulberry trees here are hundreds of years old and frame the 16th and 17th century madrassahs that make up three of the four edges of the ensemble. We will also visit Poikalon complex, also called the Bukhara Forum. The 12th-century Kalon assembly, including the Kalon Mosque and Minaret, and the Mir-i-Arab Madrassah surrounds an open plaza teeming with merchants and local vendors. We also explore the Summer Palace of the last emir and its Museum of National Crafts located a short distance outside of the city. The palace itself is something of a showpiece, as it was designed to keep the emir in luxury even though it was located outside the city. 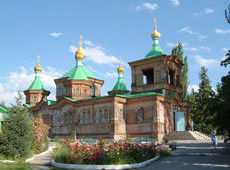 The main palace is a mixture of local materials, regional nfluences and Russian style. Western furniture abounds, but design choices reflect traditional Uzbek decorations. We leave Bukhara and drive east to Samarkand via Gijduvan city, famous for its pottery. We visit a ceramic pottery workshop and master's home where we watch a demonstration of the ceramic making process, followed by lunch. We continue our journey to perhaps the most well-known of Silk Road towns, Samarkand, fabled oasis on the fringes of the Kyzyl Kum Desert that has been settled since the 6th century BC. Due to its location on the plains where the Zeravshan River spills out from the Pamir Mountains, Samarkand became a major Silk Road crossroads and for this reason it has been visited throughout history by many of the world's conquerors including Alexander the Great, Genghis Khan and Tamerlane. Alexander said of Samarkand, 'Everything I have heard about the beauty of the city is indeed true, except that it is much more beautiful than I imagined.' Tamerlane made it his capital city and gathered the finest architects, builders and artisans of the time to enhance its beauty. Accommodation We stay in Samarkand for two nights in comfortable 4 star central city hotel offering en-suite twin, double or single rooms. Typical local breakfasts, lunches and dinners are provided. What we will experience We explore Registan Square, the centrepiece of Samarkand and the most recognisable landmark for visitors. Three emblematic madrassahs frame the square and loom over the empty space in the centre. It was this central space that originally gave the place its name, for Registan simply means 'place of sand'. This sandy place was at the centre of ancient Samarkand and was a public square and marketplace before Ulug Bek built the Ulug Bek, Tillya-Kori, and Sher Dor Madrassahs. With its reconstruction, the square retains the majesty that it has radiated through the ages. We continue our exploration with a visit Gur-Emir Mausoleum, the final resting place of Tamerlane, built at the turn of the 15th century. The interior of the mausoleum has been restored and is brilliant in gold leaf and fresh tile. The heavily gilded central dome opens over the set of tomb-markers resembling sarcophagi. All are marble, with the exception of Tamerlane's, which is a slab of solid jade reportedly from Mongolia. 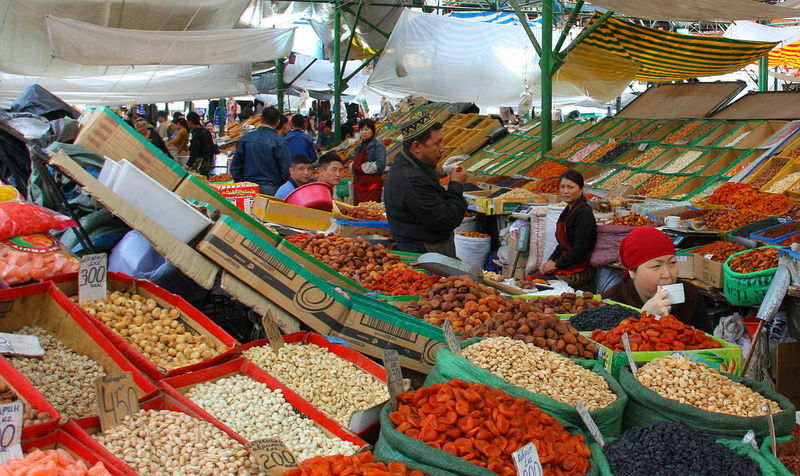 We visit the Siab Bazaar, the main bazaar of Samarkand and we will sample famous Uzbek bread. We also view the intricate process of Samarkand paper handmade from mulberry tree bark. We transfer to the train station for our short journey by fast train to Tashkent where we overnight and conclude our remarkable journey to the 'Stans' in Central Asia.